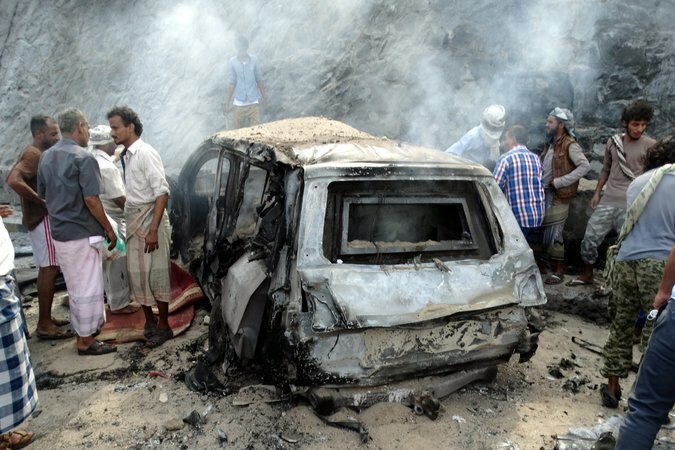 AL MUKALLA, Yemen — The Islamic State claimed responsibility for a powerful car bomb that killed the provincial governor in the southern port of Aden early Sunday, raising concerns that hard-line Sunni militants were gaining a foothold in one of Yemen’s largest cities. The governor, Jaafar Mohamed Saad, was the most senior official to be killed in Aden during a series of assassinations that have signaled the growing strength of Sunni extremists in Yemen’s nine-month civil war. The extremists include militants with Al Qaeda, but more ominously, analysts say, also an increasingly assertive and lethal branch of the transnational Islamic State. Hours after the blast, in Aden’s Tawahi district, the Islamic State released a statement claiming responsibility, as well as photographs purportedly showing the explosion. The group said it had killed eight of Mr. Saad’s bodyguards. Aden has been a crucible of fighting in the broader conflict between Houthi rebels from northern Yemen and the government of President Abdu Rabbu Mansour Hadi, which the Houthis drove into exile this year. A Saudi-led military coalition that supports Mr. Hadi began an aerial bombing campaign against the Houthis in March. The coalition, which receives military support from the United States, captured Aden from the Houthis in July. Since then, Mr. Hadi and other officials in his government have returned to the city, making it their base of operations while the Houthis remain in control of Sana, Yemen’s capital. Even as the daily fighting in Aden has subsided, the city remains insecure. As coalition forces have focused on vanquishing the rebels — fighting the Houthis in the city of Taiz, and in Marib, east of Sana — the advance appears to have left the south exposed. There have been mounting signs that Sunni militants who had fought alongside the Saudi-led coalition against the Houthis are now moving to exploit a power vacuum in Aden and nearby provinces, and carrying out increasingly daring attacks. In October, the Islamic State claimed responsibility for twin bombings in Aden that targeted a hotel housing members of the Yemeni government, as well as a base used as a headquarters by coalition soldiers. Last week, Qaeda militants briefly overran two towns in Abyan Province, about 20 miles from Aden. And on Saturday, masked gunmen on motorcycles assassinated a senior judge in Aden who presided over terrorism cases, according to a security official in the city.